The topic for the 49th edition of the Carnival of Genealogy wins hands down over Sports Illustrated: It's the Swimsuit Edition! Pull out the old photos of Grandma Moses in her seaside bloomers, Auntie Mae in her pin-up girl suit from the 1940s or 50s, cousin Paula in her psychedelic bikini from the 1970s, or even yourself in your Speedo! Let's have some fun here! Memorial Weekend is knocking on the door and that means the start of the summer sun, sand, and seaside season so let's get in the mood with summer fun photos. What? You don't have any swimsuit photos you dare to share? No problem! Tell us your best family beach stories instead! I don't know if I have many photos of swimsuits, but I do have some photos of family having fun in the sun. 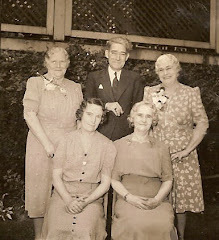 My parents' families grew up in Luzerne County PA, and I grew up in Niagara Falls, NY. It was a great place to grow up, and summers were definitely the best times of the years. Swim lessons at Niagara Wheatfield High School in the mornings, softball practice/game in the early afternoon, followed by outdoor swimming in our neighbor's above ground pool, to the MR. SOFTIE Ice Cream truck! Oh how I remember scrounging up every penny I could find to buy a soft-serve ice cream cone! Mr. Softie was often the only thing that could get us out of the pool at the very sound of its music (our parents should have recorded it and played it when they wanted us out for all the effort they put into screaming at us to get out!). 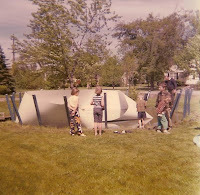 This is a picture of some neighborhood kids with my neighbor's father putting up the aforementioned above ground pool! At any rate, summers were so much fun growing up. In the summer between my 7th and 8th grade years, my family moved from the Falls to Tempe, Az. My friends were a little jealous of all the sun we'd have, which of course meant, suntans! 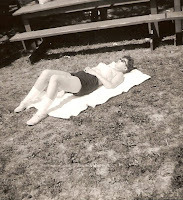 I did spend some time every summer in the sun, lying in wait for the tan that rarely came. I'm fair-skinned, and merely burned and freckled. However, time makes us wiser so they say, and I no longer sunbathe. I am fortunate so far to avoid the monstrosity known as Skin Cancer, but my brother had a scare with it last year, though he moved to Atlanta many years ago. He's fine now, but it was a wake up call nonetheless. So while we remember to have fun in the sun, also remember the one important ingredient: Sunscreen. 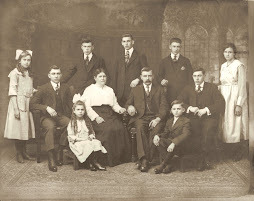 Clara HODICK, I believe the Clara that married my father's mother's brother William as opposed to Clara GORSKI HODICK who marriend my father's mother's brother Joseph. 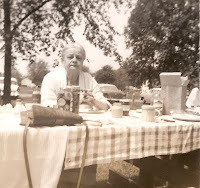 Aunt Marianne, with whom most of you are now well-familiar, with her uncle, Jack THOMAS, who married my father's mother's sister, Susan HODICK (1903-1964). 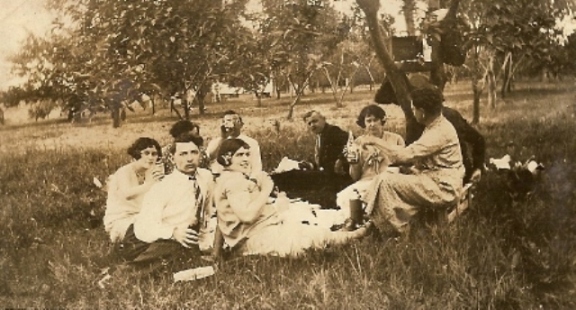 Looks like food was center of summer time fun in this family! Noreen (Norie) McHUGH SCIBILIA ROZANSKI (1934 - 16 May 1996), my father's sister. Jean Ann O'ROURKE McHUGH (18 Jan 1938 - 13 Nov 1988). My mother on a trip to Niagara Falls. 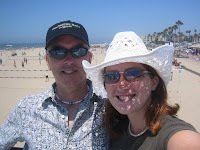 My niece, Kelley with my brother Terry. Notice she's wearing a hat? Smart girl. Must be why the Law School of Washington and Lee University in Virginia accepted her into their fall 2008 cohort! (Sorry. Couldn't help but get that in there!). Congratulations, Kelley.